State College, PA: The much anticipated groundbreaking of the RE Farm Café has been delayed from the summer start as owners Duke and Monica Gastiger pursue a new location. The planned location in Ferguson Township is no longer a viable option for the innovative farm to table restaurant. The Gastigers value the rich history of this region’s agricultural roots and celebrate the opportunities to be leaders in sustainable development and delicious food. 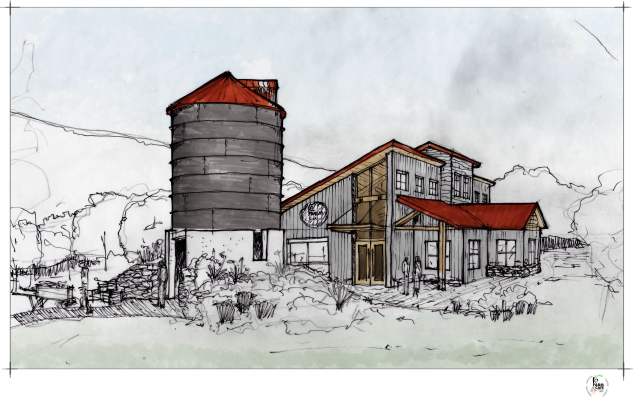 They envision that RE Farm Café will be an educational resource for the community, offering locally sourced foods creatively prepared by experienced chefs and served in a unique atmosphere. Ultimately, their goal is to be a model for sustainable development and agricultural diversification that can serve to preserve small farms and open space—both hallmarks of this region. The Gastigers have assembled a professional team to move the project ahead that includes: 7-“Group – Architecture and Sustainability Consultants, Kutztown, PA; Envinity Inc.–Construction Management and Design Development, State College, PA; PennTerra Engineering–Land Development and Civil Engineers, State College, BioHabitats–Wastewater and Wetland Consultants, Baltimore, MD; and Downstream Strategies—Landscape Architecture, Morgantown, WV.